In about 7 hours me and a couple of mates are going to head south out of Medan for Lake Toba for a week-long road trip through North Sumatra. I plan on leaving the laptop at home. The camera will be with me but it’s unlikely I’ll be making any posts before I come back. One of the biggest reasons for moving to Medan to teach English was that there is easy access to amazing places for short holidays. Christmas break is here, classes ended last Friday and the next 8 days will be spent driving our motorbikes through the Karo highlands of north Sumatra. We set out first for the city of Brastagi which is overlooked by Mt. Sinabung. This volcano hadn’t erupted since the year 1600 but in 2010 it woke up from its long sleep with quite the fury. It erupted several times in a few months and is now quite active. We plan on resting one night here and then on to Lake Toba on Tuesday morning. The three of us will be taking our time meandering slowly through the mountains. The journey by bus from Medan would normally take about 5 hours but we plan on spreading that over a couple of days by stopping in small villages along the way. It’s easy to forget just why we moved to North Sumatra to begin with. Medan is a big bustling city with lots of shouting locals, traffic jams and pollution. It’s important that we make it out of town as often as we can to recharge and get up close with the locals who welcomed us when we first arrived. Northern Sumatra already doesn’t get the tourists that other places of South East Asia get. On top of this, we’re taking a route rarely traveled by foreign tourists south through the mountains. We’ll get to come across adults who rarely have seen foreigners pass through their villages and children who may have never seen a white person before. Of course this means we might have to veer even further off the main road but we’ve all agreed that we’re going to wing it… play it by ear… and see where the road takes us. I told myself I want to try at least 10 new things this week. Horse milk? Monitor lizard? What else? Things that are taboo back home can be quite normal in these parts but I’ll talk more about that later. 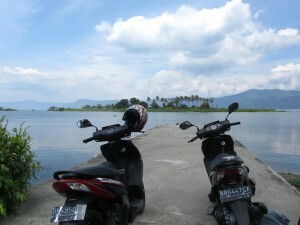 We’ll end our journey in Lake Toba on the island of Samosir. I was there earlier in 2011 but this time I’ll have my own bike giving me the freedom to move about, as well as a pretty decent handling of the Indonesian language. The lake itself is about the size of Singapore and it forms the cauldron of an ancient and massive super volcano. If you look at the map you can see how all of the North Sumatra province builds in elevation until the lake a the top. The island in the middle is Samosir which was formed after the last great eruption 75,000 years ago. There are hot springs on the island where we plan on doing some swimming. The island has since been inhabitant predominantly by ethnic Batak Tobanese people who practice Catholicism and animalism. This is in stark contrast to the roughly 86% Muslim population of Indonesia. So, it’s off to bed now, a big day tomorrow. This entry was posted in Indonesia, TEFL Related, Uncategorized and tagged berastagi, brastagi, karo highlands, lake toba, medan, north sumatra, road trip by jtafuro. Bookmark the permalink.